Vincent Van Gogh can teach us a great deal about the real sin of Apostasy. Yet, the psychoanalysts would rather turn his struggle with faith into a steamy story of drugs, whores and artistic impetus. What few people know, is before he was a painter, he was a Methodist preacher. He was an evangelist and schoolteacher. He loved God’s word, studied it and declared it. “For those who believe in Jesus Christ, there is no death or sorrow that is not mixed with hope – no despair- there is only a constantly being born again, a constantly going from darkness into light. They do not mourn as those who have no hope – Christian Faith makes life to evergreen life” (Van Gogh’s Sermon on Psalm 119:19, 29 October 1876). Why did he turn to drugs, prostitutes and painting? Why did he cut off his ear? Like Saul, he was driven mad by a spirit after departing from his first love — the true gospel first preached to him. He tasted the heavenly Manna, yet turned away to serve idols. Not heeding the warnings he himself had given his congregation, he became a living demonstration of Romans 1. The Biblical mind should see the tragedy of Vincent’s life and take from it the right lessons. History is truly understood, only by the application of a Biblical eyes and submission to the sovereignty of God. Apostasy is real and the effects on the life of those who twice shed the blood of Christ are tangible, devastating and tragic. 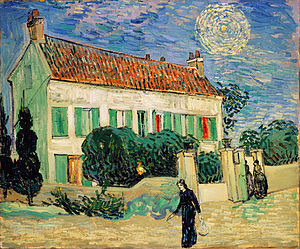 Van Gogh’s father was a Dutch reformed minister. Van Gogh wanted to be a minister as well and so left his high paying art-dealer job and took up teaching at a Classical School. He studied Greek and theology, never achieving any success. He preached and became a minister to poor miners. Not wanting to appear hypocritical, he moved out of his big house and into the huts of the miners, working alongside them. He was not, however, effective at breaking through the social bonds of the town, and was eventually removed by the Church. He languished in despair and turned his rage against perceived wrongs, by the Church, toward His King Jesus Christ; Vincent departed from the Faith of his fathers and the organized Church. He made the canvas his pulpit and poured his legendary passion into it. He was the artist-monk. Van Gogh “Came to believe that his own day had so perverted the truth that proper society was now inhuman…in his isolation and poverty he would paint ‘not only with colors, but with self denial and self-renunciation and with a broken heart’ ”( Van Gogh and God, 9). He was a revolutionary, attracted no longer to helping the poor, but instead, expressing God by recreating God’s beauty through art the way he saw it in nature, contrary to the way he thought God was portrayed in the dead formulas of the Church and soulless sermons of her pulpits. He took in a prostitute to clothe, feed and care for, just as God had taken in Israel in Ezekiel 16. He was consumed with the desire to be “the savior;” the righter of wrongs, the revolutionary against the establishment, the anti-Calvinist, the christ whose words were paintings and whose cross was the easel. His self-love became self-loathing to the extreme. The result of taking the prostitute into his house was social estrangement, and the wasting of his strength with physical ailments (generally associated with houses of ill repute). His brother Theo supported him financially, because Vincent failed in all of his professions. The success of men like Bouguereau, his loathing for the Church and the desire to be understood, drove him barmy. The projection of self was his life’s work, and his product was no good. Incapable of finding success, socially unacceptable, wasted by disease and drink, and offering no viable benefit to society, he literally went mad — he abandoned Grace, so Grace abandoned him. He asked a prostitute to marry him and when she said she would only if he cut off his ear for her, he complied. Theo’s wife had recently given birth, so in an effort to relieve the pressure on his brother’s wallet, Van Gogh shot himself in 1890, survived a few days and then died, believing to have suffered and served his brother at last. His brother Theo died four months later of grief. What does this story teach us? Baptized, ordained and fully immersed in the word of God and the Doctrines of the Church, Van Gogh abandoned it for the glory of himself. His view of compassion, service and love was trite . He was a revolutionary and his life ended like so many other revolutionaries…selfishly destroyed. Though he came from a long line of pastors, covenant succession is never secure apart from faith in Jesus Christ. One Lord, One Faith, One Baptism was not enough; Van Gogh did not heed the lessons of scripture and could not accept God as God. Instead, he blamed God for the ills of the world and the nature of man. We can teach our children T.U.L.I.P., but we must pray that our God writes His Word on their hearts and demonstrate to them the good life in Christ. We must pray for fortitude during the trials in our own life. We must pray to God for the mercy of not raising hypocrites. History is God’s story. Vincent Van Gogh’s life demonstrates the real sin of Apostasy. What becomes of fools and rebels? They live and die as Van Gogh did. Yet, God could have delivered Van Gogh even as death stood at the door. Great was the wickedness of Van Gogh, but greater is the mercy of God. We do not discern hearts, and a sinner could be granted repentance and deliverance while he still has air in his lungs, but the fruit of a life lived apart from God is shallow, meaningless and short. The irony of Vincent Van Gogh’s international fame occurring long after his death is not a coincidence. Its a lesson. Is that greatness worth sacrificing eternity with your Savior? Theo died of the guilt and grief of knowing that supporting sin and being too weak to confront it, does nothing but multiply it. Whom do you know who needs loving rebuke or encouragement? Take an important lesson from the Methodist Painter and speak the truth in love and go after the lost sheep..